After years of pitching dominating MLB, offense has returned with a huge rise in home runs. But is that actually a good thing for the sport? 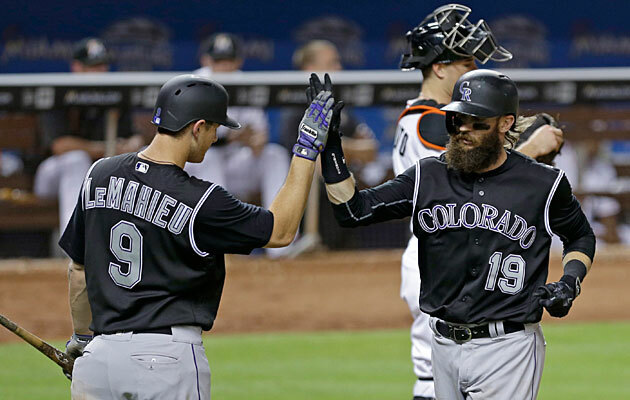 On Monday night in Miami, the Rockies beat the Marlins, 5–3, as both teams set a major league record with solo home runs accounting for all eight runs. It was entertaining and fluky—and one more sign that the Great Offensive Recession is over and a decade of pitching dominance has ended. The oddly strong uptick in offense we saw in the final two months of last season has continued this year. But here’s the bad news: It’s a very narrow recovery. The home run is almost solely responsible for more offense. Baseballs are flying out of stadiums like we haven’t seen since the height of the Steroid Era. Percentage-wise, home runs are up by double-digits for a second straight year. And when it comes to the percentage of fly balls hit that become home runs, we’ve never seen anything like it, not even in the Wild West days of steroid use. • There were more total bases last September than in any month in the history of baseball (or, if you prefer to account for expansion, the 18 years with 30 teams). • More home runs were hit last September than in any month except May 2000. • For the 2015 season, home runs jumped 17.3%, the biggest spike since 1996. • With 40% of the schedule this year completed, home runs are up another 12% from last year. • We just watched the biggest May for home runs since 2000, and June is on track to see the most homers ever in the month. • Only two seasons in history ended with a bigger home run rate than what we’re seeing this year: 1999 and 2000. • Runs per game are the highest since 2009. • The percentage of fly balls that are home runs jumped from 9.5 in 2014 to 11.4 last year and now to 12.7 this year—a freakish two-year increase. Does anybody else remember the dark days when the major league batting average was the lowest in the history of the DH era (since 1973); when the home-run rate hit a 22-year low; when runs per game hit a 33-year low; and when many of us brainstormed for rules changes to invigorate offense (limits on relief pitching, bonus batters, lowering the mound, etc.)? Folks, all that was just two years ago. • Should Braves make Julio Teheran available in trade market? The home run has taken care of the dark days of offense. It’s not as if hits are raining all over the yard: The rate of hits per game hardly has moved since the 2014 offensive nadir, and we are on pace to see only about 200 more hits over 2,430 games. Stolen bases (at their lowest rate in 44 years), aggressive base running, bunts and multiple-hit rallies are not making a comeback any time soon, either. The offensive surge is being led almost entirely by home runs. The percentage of fly balls that are home runs is the highest in the 16 years of such recorded history—higher than even the last year before steroid testing. 1993 and '94: Immediate result of expansion. 1969 and '70: Immediate result of lowering the mound. 1946 and '47: Immediate result of players returning from war. 1929 and '30: First generation of players after Babe Ruth popularized the home run, playing with a cushioned-cork center ball introduced in '26. In each case, we have an easy way to explain why home runs spiked in back-to-back years. So what’s going on this time? We have no expansion, no significant rules changes to goose offense and no changes to the baseball—or so Major League Baseball says. This is where conspiracy theories begin. You’ll have a hard time convincing pitchers and pitching coaches that the baseballs are not livelier. MLB officials insist no changes have been made to the baseball. They have examined them this year and found no difference. It might surprise you to know that official Major League baseballs are not of uniform size and weight. For manufacturing purposes, and by official rule, MLB permits an allowance of as much as one-quarter of an ounce in weight and one-quarter inch in circumference. That’s a fudge factor of 4.9% in weight and 2.6% in size. Baseball wouldn’t covertly make the balls livelier, now would they? It happened in 2013 in Japan, where NPB commissioner Ryozo Kato resigned in disgrace after the league surreptitiously changed the rubber inside the baseball to facilitate more offense. Ask major league hitting coaches, and they will talk not about the baseball but about the modern approach to hitting. Thanks to widespread acceptance of analytics, this is the first full generation of players that does not regard batting average as sacred or strikeouts as taboo. The home run surge just might be due to what the pitcher/batter confrontation has become: a game with more all-or-nothing consequences. Velocity has increased so much that just making contact has become harder. So if analytics have devalued batting average and removed the stigma of strikeouts, why not sell out for home runs? The highest paid player in baseball, Marlins outfielder Giancarlo Stanton (who hit one of those eight home runs on Monday), is a career .265 hitter who strikes out in 29% of his plate appearances, has stolen four bases in 201 opportunities over the past two years and has gone from first to third on a single once this year. Make no mistake: Baseball has turned a corner these past two years almost entirely on the home run. But if this path becomes one with an increasingly unathletic game reduced to the monotony of the so-called three true outcomes—strikeouts, walks and home runs; in which you truly don’t need anybody else on the field—we may want to look for another corner to turn.